The cmompay has posted a video on Facebook demontrating the new fast charging solution. In the video, the Xiaomi phone is compared to the OPPO device. As the latter is offering one of the fastest charging technologies on the market, it turns out, once the Xiaomi Super Charge Turbo is out, it will be twice faster than the OPPO’s technology. is the OPPO R17 Pro, which is known for its highest commercial charging power. Although the latter supports a 50W fast charging, it only reaches 65% (3700mAh) in 17 minutes. Xiaomi didn’t offer any further details about how the new fast-charging technology works. Although the Type-C connector already supports 100W of power draw, the bigger challenge with delivering this much power is getting it into a small battery without overloading it. Oppo’s Super VOOC solution achieves this in part by splitting its 3,400mAh battery into two separate 1,700mAh cells. 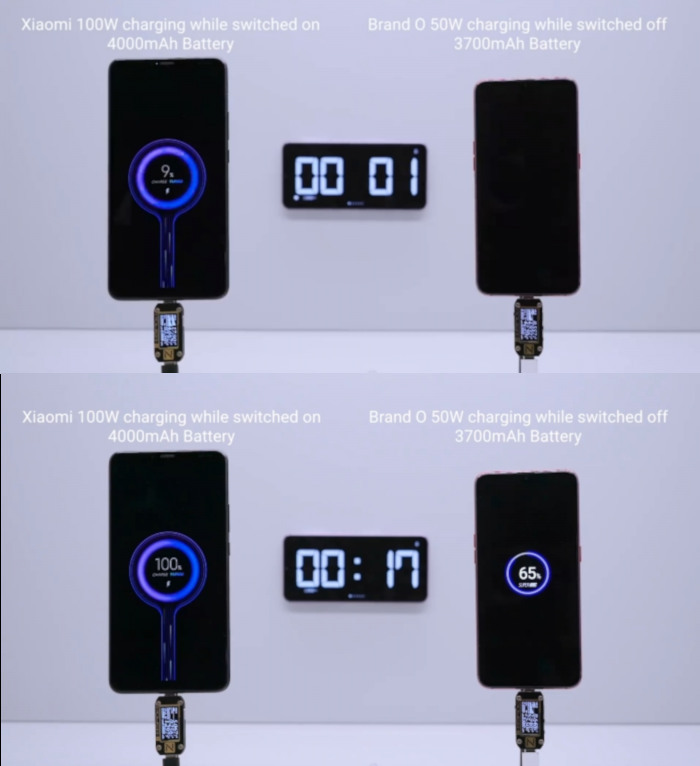 Xiaomi has already introduced the first smartphone to feature 20W wireless charging with the latest flagship Mi 9. But the company did not announce which, if any, handsets the new technology is coming to. i don't know how the charging really works but it sounds like a good step forward.